We sincerely thank IP2Location for allowing us to use their database on this site. IP2Location is a company that provides mapping between an IP address and a physical location. They offer several databases proving information like country, city, zip code, latitude and longitude and weather for a given IP address. For more information visit http://www.ip2location.com. Note: This demo uses the same technique as described in this article to fetch location based on an IP address. Visit IP2Location to download the CSV file. This file is in the following format. First IP address in Netblock. Last IP address in Netblock. 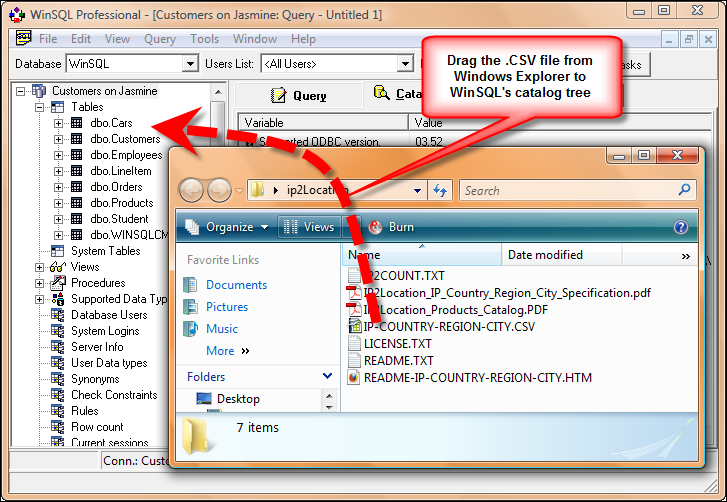 The easiest way to import a .CSV (comma separated value) file into any database is to drag a file from any folder to WinSQL's catalog window. Click here if you are not familiar with WinSQL. Although I am using Microsoft SQL Server in this example, WinSQL can be used to import/export data from any database using simple mouse clicks. If you run into problems or need more information on how to import this file into SQL Server, click here to watch a video tutorial. During the import process WinSQL will prompt you to change field names and datatypes for the target table. 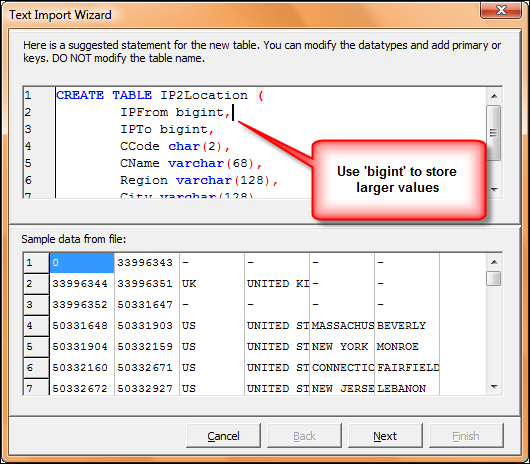 It is important you use bigint instead of integer when creating a new table. This is because a normal integer is not large enough to hold an IP address. Once the data has been imported, you will have a table with the following script in the database. The newly imported table contains IP addresses in a numerical format, which is different from the more commonly used string format. The best way to convert the string representation of an IP address to a numeric value is to write a function in SQL Server. The following script shows a function that accomplishes this task. There is a significant problem with this query: it runs very slow. The machine we ran this query on took about almost 1 minute to run. This is because the table contains almost 3 million entries and the SELECT query above does not use any index. In fact, it cannot use any index. The first step in optimization is to create a couple of indexes. The following script will create two indexes on the table, one on each field. Next, we have to re-write the SELECT statement so it uses the newly created index. One important information to keep in mind is that field names should always appear on the LHS (left hand side) of the equal sign. When field names appear on the RHS, most RDBMS won't be able to use an index. The above query will now run significantly faster. In our testing, the response time reduced from 1 minute to about 68 milliseconds. Optionally, you can create either a stored procedure or a function to make life even easier. The following script show how to write them. Once a stored procedure is created, you can simply type the following to get the location of an IP address.